The personal memoirs of a Pennsylvania surgeon who made repeated and lengthy trips to the Central African Republic to do surgeries and to train Africans in surgical techniques has just been released by BMH Books of Winona Lake, Indiana. 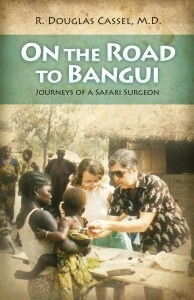 “On the Road to Bangui: Journeys of a Safari Surgeon” was written by the late Dr. R. Douglas Cassel, a Pennsylvania general surgeon who invested significant amounts of time in working with missionary surgeons and training African medical personnel in the French-speaking sub-Saharan country of Central African Republic. Highlights of the 133-page paperback include some of Dr. Cassel’s first memories of encountering the sights and smells of sub-Saharan Africa, along with many stories of difficult surgical cases and seeing God work in unexpected and miraculous ways. Also a student of history, culture, and disease, Dr. Cassel includes insightful commentary on political and economic conditions, the spread of diseases such as polio and AIDS, and observations on how to find spiritual hope when under great stress and duress. Dr. R. Douglas Cassel (1934-2012) was a native of Hershey, Pennsylvania, who attended Penn State University. His medical education was from the Hahnemann Medical School and his residency was completed at Harrisburg Hospital. He also earned the Master of Divinity degree from Grace Theological Seminary, Winona Lake, Indiana. The list price for “On the Road to Bangui” is $14.99 and the ISBN number is 978-0-88469-281-2. The book is available from bookstores, from online booksellers, and at www.bmhbooks.com. Dr. Cassel worked primarily with Grace Brethren missions in the C.A.R. and the book is timed to celebrate the 100th anniversary of Brethren medical missions in the country. The book includes history and background from former Grace Brethren missionaries to Africa Eddie Mensinger and Roy Snyder. In Africa, Cassel worked with Drs. Taber, Walker, and Mason. Until November 1, 2012, a copy of the book is available without charge for any Grace Brethren church , pastor, or missionary. Copies may be picked up at the national conference in July, or at the BMH offices at 1104A Kings Highway, Winona Lake, Ind. They may be shipped to any U.S. address for a $5 shipping and handling charge (checks payable to BMH Books, PO Box 544 Winona Lake, IN 46590 or call 1-800-348-2756 to use a credit card). After November 1, copies will be available to all at the retail price. Doug Cassel went to medical school at the strong advice of my father, the late Rev. Russell H. Weber. He had planned to be a veterinarian, but the Lord used him as a doctor both in Africa and in his home community of Harrisburg. It was a privilege to have known him as a young man I looked up to as a 12-yr-old, and then to work with him in a rescue mission just a few years before he died. I look forward to reading his accounts. I never knew that Pastor Weber, who was also my pastor in Harrisburg, was influential in Doug becoming a surgeon. I recall travelling with Doug to the University of PA when he first thought of going to vet school. Doug was my favorite cousin so it was my privilege to work on his memoirs since 2005, and then edit and type it for publication at GBMH. My sisters and I well remember the Weber family, and the influence that Nancy Weber they had on our lives musically.